Whether having teeth leads to chewing or chewing is the outcome of having teeth is a “chicken or the egg” paradox, although dogs will eat both so why are we even debating? 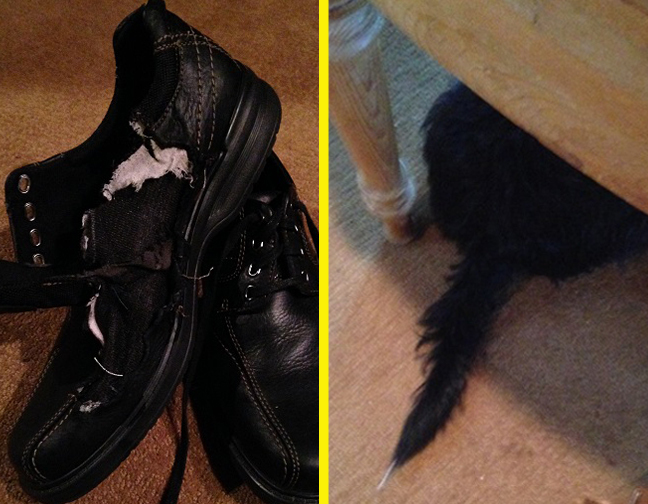 Let’s instead focus on the reasons dogs chew my shoes and socks and, to a lesser extent, yours. Who chewed the shoes? Can you solve this Minute Mystery? For the answer, turn to page 159. • Another shoe and sock, damn it! • Oh, for God’s sake! Another shoe and sock? Some dogs can quickly learn to avoid forbidden items with just a bit of guidance, a few treats, and an instructional PowerPoint presentation. However, most dogs know exactly what they’re doing when, say, they chew up $75.85 in uncashed checks, as was the case with our formerly alive terrier thing, Oxford. Giant 2 still insists it was a coincidence that Oxford ravaged four checks taken from four locations over five weeks. It was all just paper to him, she says. He didn’t know any better. He was just a dog! No, he was a terrier. Some dogs track explosives. Others uncover drug caches. Terriers foment crime. Of course Oxford knew that checks were valuable. Dogs have a surprisingly keen understanding of the Federal Reserve. Also their own sophisticated monetary system based on tennis balls. But Oxford wasn’t after the money. His was a mission to corrupt young Brisby, the schnoodle who can do no wrong. Next: Wait! Weren’t we talking about shoes and socks? …excretory system works like Comcast, indeed!